Joanne's Page for ESL Teachers: Tips: Boosting Vocabulary. Advertisers know if they can get children to repeat their "jingles" (advertising put to music), their message will be effortlessly repeated over and over. 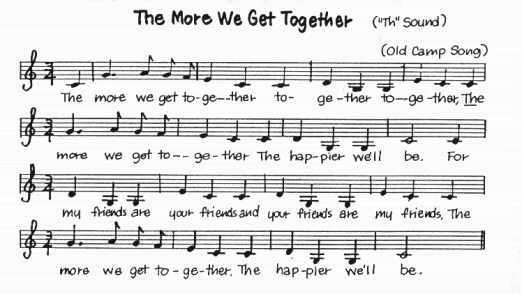 A catchy little tune makes learning easierso let's put that ability to use. The best teachers are able to give their students three times as much practice as poor teachers. The teacher will tire of repetition long before the student! Check to be sure you can see their tongues peeking our from their teeth when they practice the "th" sounds. Clarify "your" and "my", by taking the student's wrist and turn their hand toward another person and say "your." Turn their wrist back and point their hand toward themselves for "my". Short vowels are always the most difficult for the non-English speaker. This is especially true of the short "a" and the smiling "A." 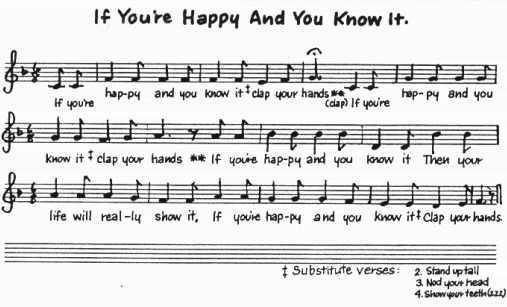 In this song the words happy, clap, and hands provide repetition of these sounds.